...of pickled peppers. A peck of pickled peppers Peter Piper picked! I'm a weirdo, I admit it. I have peculiar taste buds. I enjoy sauerkraut, but hate cabbage. I don't like tomatoes, but love tomato sauce. I love cheese...but only sharp to seriously sharp cheddar. I won't eat cheese with bread or on sandwiches. The one exception...a peanut butter and jelly sandwich. But in order for the cheese to be on this sandwich, there must also be potato chips on the sandwich...and the occasional stray pickle. I love boiled eggs, but will not eat fried, poached, scrambled, deviled or pickled eggs. Most southerners are pickling fools and enjoy a variety of "pickled" foods...pickled beets, pickled okra, pickled corn, pickled peppers, pickled sausage, pickled asparagus, pickled onions, pickled watermelon rinds (from my friend Donna) and many other things...most of which will not cross these lips, ESPECIALLY pickled pig's feet and pickled pig's ears. Yep, you read that right. Blech and gag! Yessir, down here in the south, we are pretty adept at pickling just about anything. With the weirdness of my taste buds, I only eat a few pickled items...sauerkraut, pickles, bell peppers, olives (green, not black) and Greek peppers. Occasionally I will risk my life for jalapeno peppers (I'm highly allergic to them). While I was preparing pickles, I decided to go ahead and pickle some bell peppers. I love pickled bell peppers, but do not like stuffed bell peppers and do not like unpickled bell peppers in my salad or on anything else I eat. See...WEIRDO! 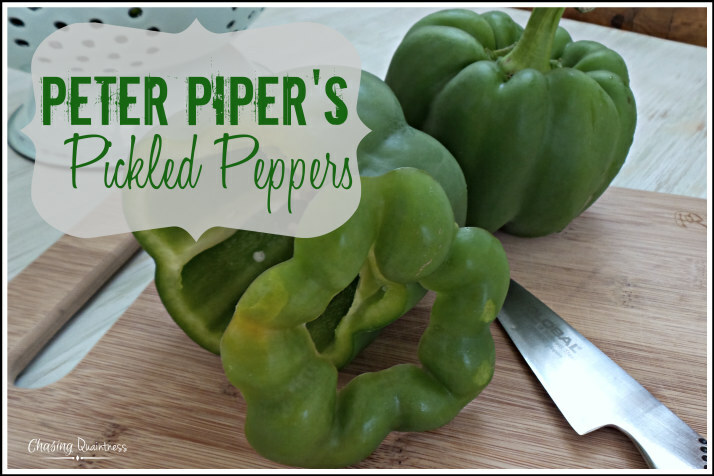 Pickling bell peppers is a pretty simple process and you can eat them after they have "pickled" for a couple of days. I like them crunchy rather than soggy, so I start eating them as quickly as I can. This deal is easy peasy and you can't really screw it up. 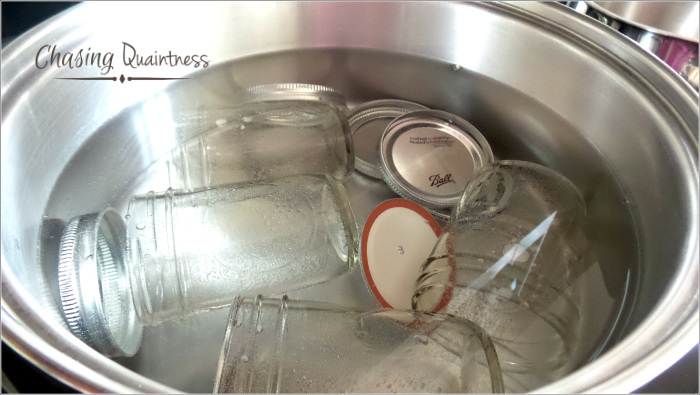 Start by sterilizing your mason jars. You can get any size you want for the peppers, but I used the half-pint jars since that is what I had available. While the jars are boiling and draining, wash your peppers and cut them into slices. These peppers can be served with any meal and you can chop them up and put them on a salad if you want a little "bite" to the salad. I'm going to strongly suggest you do not eat pickled pig parts....you will not like it. And believe it or not, you can find them on grocery store shelves here in the south. Scout's honor!! Oh, and before I forget...the pickles were excellent! ~doing the happy dance because I didn't screw them up~ On one of the jars the lid never would "ping", so I opened it. I ate every pickle in the jar! Seven quarts half-pints to go! Good Morning! Goodness it is so nice to meet you and come back to Texas, we miss you!! I know just how you feel, we moved away for a few years and our hearts ached to get back here, so here we are, even getting ready to build a brand new house! woohoo! 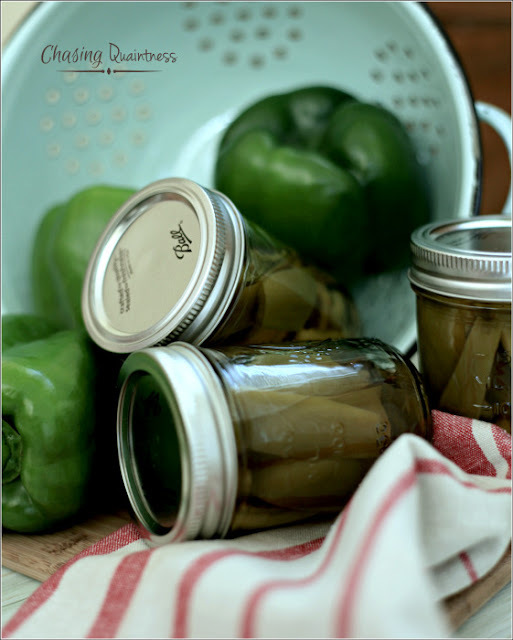 Now, to these pickled peppers (yum) and you just know our Texas taste buds would love theses . I love your writing and photography- seriously going to give these a try! Hi Jemma, thank you so much for the sweet words! We do miss it and hope to get back soon! I was raised in Alabama, but feel such a kindred spirit with Texans, as though I were born there instead! :-) Awesome on building the new home! I know it is an exciting project and can't wait to see it on your blog! You will like the pickled peppers if you like tart foods. If not, they will give you a pucker that no sour lemon can compete with! :-) Let me know what you think if you give them a try! Have a great day! Hugs!! When I could eat bell peppers, I soaked them in cider vinegar for a day, then tossed them in a salad. I really only like raw vegetables. Try pickled watermelon rinds - I bet you like them. You left off pickled eggs - Knott's calls theirs Pickled Peeps. I had a student who brought pickled pig's feet for lunch each day. I had to buy a small cooler to keep the horrible things while we had class. Oh, and I LOVE pickled cauliflower. They are a different flavor…very tart! :-) My mom used to eat those things also…just gagged me and I couldn’t stand the smell. You will have to read tomorrow’s post. I elaborate a tiny bit about the pig’s feet and added a sentence after I read your comment. :-) I still can’t get that song out of my head…so I also put that in tomorrow’s post..LOL. Big Hugs back at ya!!! I used to be a pickling maniac in my younger days. My house reeked of vinegar until October. No pig products in my pickling kettle but I remember my father eating them back before everyone got all health conscious. 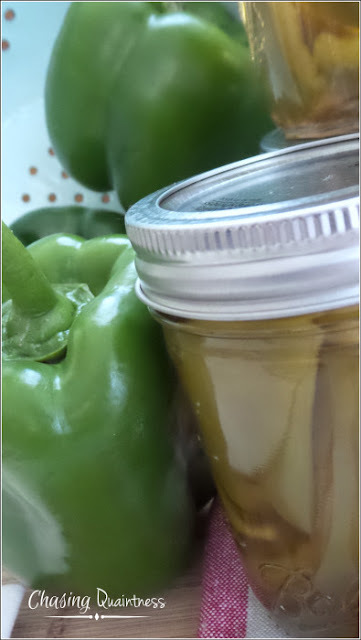 I used to pickle bell pepper relish that made soup beans (what we called pinto beans) taste wonderful, but never tried pickling just the bell pepper strips. I'm sure I would love them. I love the way you wrote about your peculiar taste buds! You're a doozy, Benita, as Boolie used to tell his mother, Miss Daisy! Thank you so much Dewena! :-) My peculiar taste buds drive people insane sometimes...LOL! I always tell them to not ever try to prepare a meal I will eat. :-) Unless it is turnip greens and cornbread with some fresh onion, then they better have a bottomless pot! Hey chick! I’ve not had the watermelon rinds either, but am going to give them a try. Donna says they are good. I’ve seen the pickled eggs that are in pink juice. I didn’t know that was beet juice…interesting! I’ve never had pickled peppers with any other color but green. I would suppose any color of the peppers could be used for pickling. AND it would be pretty in the jars! :-) I was so excited about the pickles!!! So, thank you!! :-) Have a great day and evening! Hugs!!! I am not into many things pickled, except pickles! I do recall, in the recesses of my memory, eating pickled pigs feet when I was a kid. And I live in Upstate NY! I think it was an Italian thing. I also tried baby octopus, squid and frogs legs as a kid. Also an Italian thing I think. I was pretty naïve as a kid.....I say yuck now to the frogs legs and pigs feet. I do eat squid as calamari now. I have had pickled pig's feet...used to be a staple in my house...a very unfortunate fact. I don't know why my Italian relatives all loved them. We used to get them from the Italian pork store up the road. I remember liking them as a kid (and you think you're a weirdo! ), I outgrew that taste. Needless to say that today anything pickled is really not my favorite. You do have some rather strange food habits, I must say! Did I read potato chip ON a sandwich? 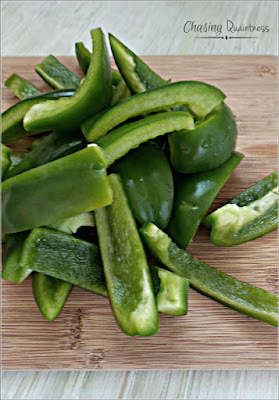 I can't eat peppers and certainly couldn't eat anything like jalepenos due to acid reflux problems. Potato chips IN the sandwich, huh? Brenda, I most definitely do have weird taste buds! LOL And yes, potato chips in or on the sandwich. It's actually very good, sort of like putting your french fries on the hamburger, which is only good at McDonald's though. And like using Wendy's fries as a spoon for your frosty. I know it is bizarre...LOL My sisters have reflux issues and can't eat them either. Fortunately, I've been spared so far. After Thanksgiving, the hubster looks forward to his leftover turkey, potato chip and mustard sandwich! LOL...indeed I do! I laugh at myself about it all the time!! I like potato chips on my pb&j too! Fritos are good on there as well. I like pickled vegetable, but nothing else. The foods I can't stand the most are.. tapioca, rice pudding (not gonna tell you what those look like to me in polite company), and flan. GAG.